Papers: August 20, 1863; February 14, 1864; September 16, 1866; January 22, 1875; June 11, 1875. 5 letters. To Evarts. Also a signed commission in the John Philbrick papers, 1824-1886. Papers: Correspondence in George William Curtis papers, 1842-1892. Finding aid. Papers: 1849-1887. 3 linear feet. Correspondence, notes, arguments, briefs, newspaper clippings, and other legal and legislative papers relating to cases in which Evarts was involved. Topics include legal action involving ferries and street railways in New York City, U.S. Navy Yard on the East River, land claims, railroads, Missouri test oaths (1866-1869), and post-Civil War problems in the South. Papers: Correspondence in Lew Wallace papers, 1799-1923 (bulk 1846-1906). Papers: 1 pardon endorsement (August 19, 1867) in Bookfellow Foundation autograph collection, 1793-1945; correspondence in George Bancroft papers, 1819-1889; and 1 letter (June 17, 1876) in Seymour autograph collection, 1750-1945. Papers: 1834-1908. 14.6 linear feet; ca. 12,250 items. Includes personal and official correspondence, and business and legal papers. The correspondence chiefly relates to service as secretary of state and as senator and includes information on foreign relations, force bill, patronage, currency, pensions, tariff, suffrage, and education issues. Finding aid. Papers: Correspondence in Joseph P. Bradley papers, 1836-1971. Papers: Correspondence in American Committee on the Statue of Liberty papers, 1875-1901. Papers: Correspondence in Benjamin Sheman Brooks papers, 1850-1881. Papers: Correspondence in Ferry family papers, 1822-1905. Papers: 175 letters (1855-1881) in various collections. Finding aid. Papers: In Richard Henry Dana, Sr. and Richard Henry Dana, Jr. papers, 1839-1881. Finding aid. Papers: In Evarts family papers, 1753-1960 (bulk 1798-1901). Ca. 20 feet. 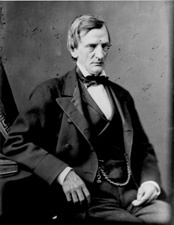 The William Maxwell Evarts material relates to New York politics and law, work as a diplomat, as secretary of state, and as U.S. senator. Includes material relating to the trial of Jefferson Davis. Finding aid. Additional Papers: In Colton family papers, 1749-1879 (bulk 1826-1879); Alexander Stewart Webb papers, 1818-1930; Edwards Pierrepont papers, 1813-1902; Samuel Wells Williams family papers, 1824-1936; Gardiner-Tyler family papers, 1843-1898; Carrington family papers, 1749-1929; Samuel Bowles papers, 1853-1890; and Woolsey family papers, 1750-1950 (bulk 1811-1921).